1. 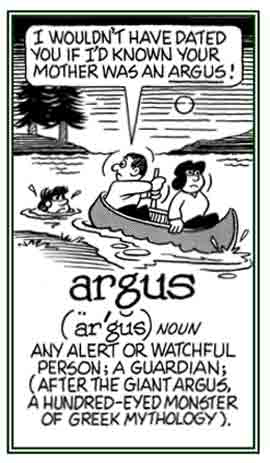 An alert or watchful person; a guardian who protects others: The first child of Mark and Nadine, now three years old, needed an argus as a babysitter who would be attentive and perceptive and keep little Tommy out of trouble when his parents were at work. 2. In Greek Mythology, a giant with 100 eyes who was the guardian of Io and was later slain by Hermes: When Jill was reading about Argus, she found out that after Argus died, Hera transplanted the monster's eyes into a peacock's tail. © ALL rights are reserved. 1. Relating to being vigilantly observant and watchful with visual perception: Toby, the Argus-eyed cat, was out in the garden looking for a mouse to appear for his snack. 2. 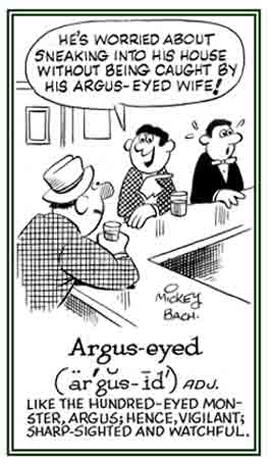 Characteristic of someone who is carefully observant and on the lookout for possible danger: Jane, as a young mother of a toddler, was an Argus-eyed parent for anything hazardous that might be lying around in the house. © ALL rights are reserved.